Back in January this year we introduced you to IMGuest, a service that lets users improve their networking by ‘following’ other users to see when they’re staying in hotels close to them. 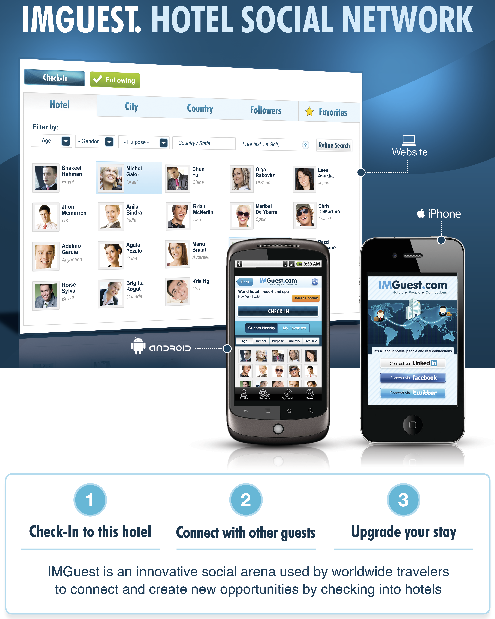 Now the Israel-based startup has launched premium features which it hopes will get hotels themselves using the service to enhance their online offering for guests. The paid-for offering gives hotels an interactive message service that allows them to award guests with benefits and promote services to them, filtered to target specific demographics. “Through this platform, the hotel managers or hotel social media coordinators can send direct messages and announcements to their guests and their followers regarding specials and benefits, and thus making the hotel much more cool, social and productive place,” co-founder Yossy Mendelovich explains. Pricing for the premium offering starts at $50 US per hotel per month, but larger chains will be able to negotiate cheaper rates depending on the size of the chain and the hotels themselves. “Does the world need a ‘Foursquare for hotels’?” we asked when we first covered IM Guest, and that’s probably still a fair question from many users’ points of view. However, pitching the service as an easy to set up ‘plug-in’ social network for hotels to share information with guests may help the service grow, if the travel industry takes to it.